Everyone assumed Chewbacca wore that bandolier because it was full of ammo, but it turns out it might have been due to personal space issues. 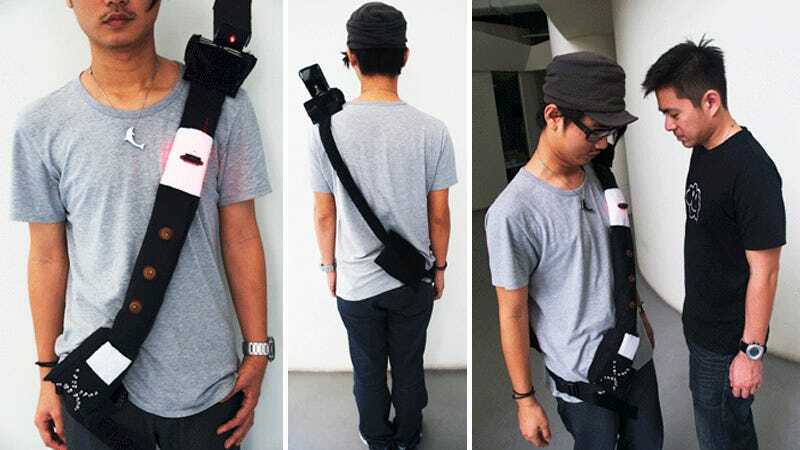 At least if his bandolier worked like Zac Ong's creation which creates a laser perimeter letting people know when they're too close. On the wearer's left shoulder is a spinning laser that creates a visible 360 degree personal zone that other people should stay clear of. But if they dare to invade that private space, an infrared sensor located on the chest detects their presence and activates blinking LEDs, and random spinning contraptions, that reflect the wearer's increasing anxiety the closer someone gets.